We naturally think that a used equipment purchase will result in cost savings when compared to buying new equipment, but that isn’t always the case especially when it comes to LPG bulk storage. More and more propane retailers are increasing bulk storage capacity and current demand for used storage tanks is high, especially for tanks that are in good shape. If you’re adding bulk storage and considering used equipment, then take some extra time to fully understand how this decision will impact your business. 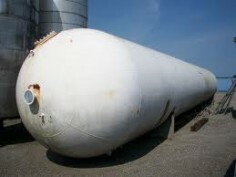 Availability is limited due to today’s increased demand, but if you’re fortunate enough to locate one, you should be able to purchase a used LPG storage tank for less than a new tank. However, there can be additional costs required to insure that the used equipment is safe and reliable for years to come. For instance, valves and plumbing in used tanks often need to be replaced and that cost can be substantial. If you have the time and know-how, doing it yourself can save money, but if you have someone else handle it for you, the cost for a new valve kit and plumbing can run as much as $35,000-$45,000 installed. And what about the effect on the value of your business? Another factor to consider when purchasing a used storage tank is the effect on the value of your business. All too often business decisions are made based on short-term needs with little or no thought given to long-term effects. In the short-term, and assuming no substantial upgrades are required, a used tank purchase may save you some cash and you will be able to deduct depreciation expense. However, five to ten years from now the salvage value (the remaining value of an asset after it has been fully depreciated) will be substantially less for a used storage tank than it would be for a new one. Accordingly, the value of your business assets and the value of your business as a whole as reflected in the balance sheet will be less. Whether you plan to sell the business or hand it off to a partner or family member, remember that the decisions you make now are determining future value. For example, assume you need a 30,000 gallon LPG tank for a new bulk storage facility and you’ve found a used one for $60,000. It’s salvage value is estimated at $15,000. You’ve also found a new 30,000 gallon tank for $90,000, but since it’s new, it has a higher salvage value which is estimated at $60,000 (assumes the same amount as today’s used tank price). In this case, assuming you don’t have to make any upgrades to the used tank, you’ll save $30,000 on the purchase price, but at the end of it’s useful life your balance sheet will reflect a $15,000 asset value whereas the new equipment will show a $60,000 value – a difference of $45,000 net worth in your business. The obvious attraction for purchasing used is price, but used equipment carries a good deal more risk than new. Listed below are just some of the potential pitfalls to be aware of. Source This may be the most critical issue of all, as so many problems hinge upon the honesty of the seller. Can you trust the source? Is the supplier reputable? An individual seller has no reputation to protect, so you operate on blind trust that the person is honest. Warranty Check to see if you will have a warranty. Most manufacturers do not offer a transferable warranty. Thus, if a problem does arise, it is likely that you will have to pay for repairs. Condition Unless you can personally inspect the storage unit before you buy (and you know what to look for), you rely completely on the seller to accurately describe the equipment. A photo is great, but even that may not be enough to spot many problems. And remember, condition goes beyond the external appearance. Financial Risk More of an issue when dealing with an individual, this can be one of the most devastating potential consequences of the transaction. More often than not, Cash On Delivery (C.O.D.) is the method of payment between individuals. This requires a level of trust on both parties. At the end of the day, the decision to buy used versus new bulk storage will be based on your unique financial situation. The important thing is to realize that there are factors other than just purchase price that you need to consider. Do your homework, look at all of the costs required to make the the storage vessel safe and production ready, take the time to review the long-term effects on the value of your business and give serious consideration to the risks involved before you decide.